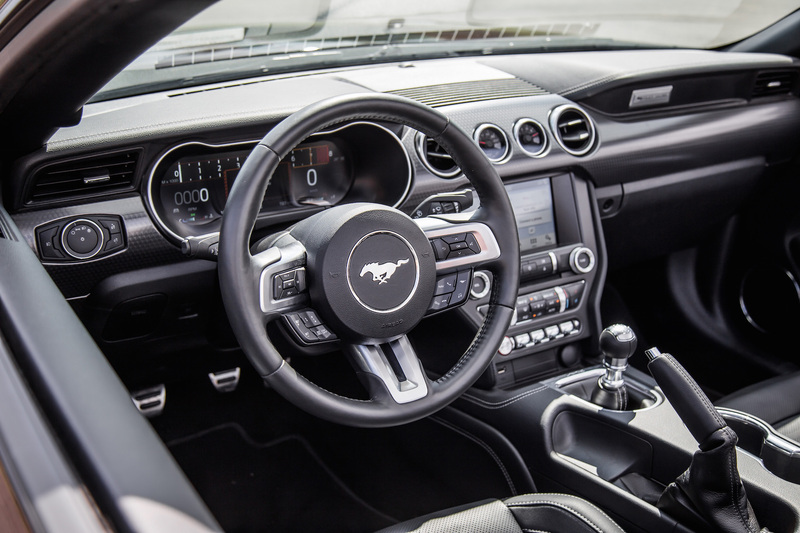 Contrary to popular belief, the Ford Mustang doesn’t just compete against its muscle car compatriots like the Chevrolet Camaro and Dodge Challenger. This arena of sub-$50,000 sports cars houses a dizzying array of gladiators that are just as capable on the track as they are at raising heartbeats and goosebumps on city streets. 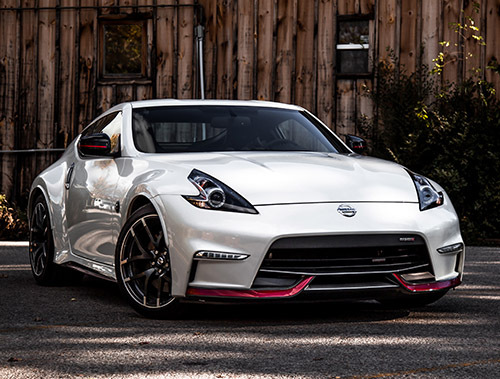 I’m talking about the Nissan 370Z NISMO, Subaru WRX STI, Mazda MX-5, and the MINI Cooper JCW. Sure, none of them have a high displacement V8 and not all are available as a convertible, but they are equally as attractive in terms of value, performance, and driver involvement. 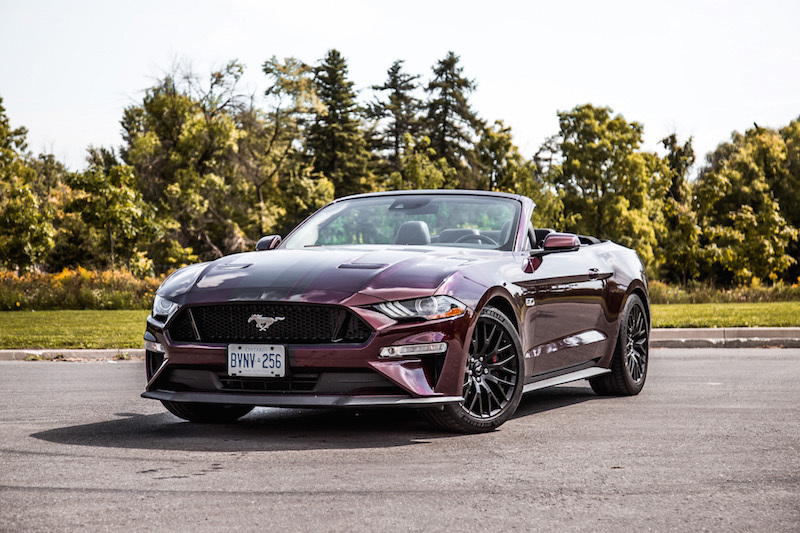 So does this revised 2018 Ford Mustang GT Convertible have what it takes to stand out from the crowd? First thing’s first, let’s go over the revisions for 2018 because they are quite significant. The 5.0-litre Coyote V8 has been reworked ever so slightly with a 0.8 mm larger bore that raises displacement from 4,970 cc to 5,030 cc. There are new cylinder heads that offer a higher compression ratio, and it utilizes both direct and port injection to raise power from 420 hp to 460 hp. Torque equally swells up from 400 to 420 lb-ft, and the redline has been bumped up from 7,000 to 7,400 rpm. 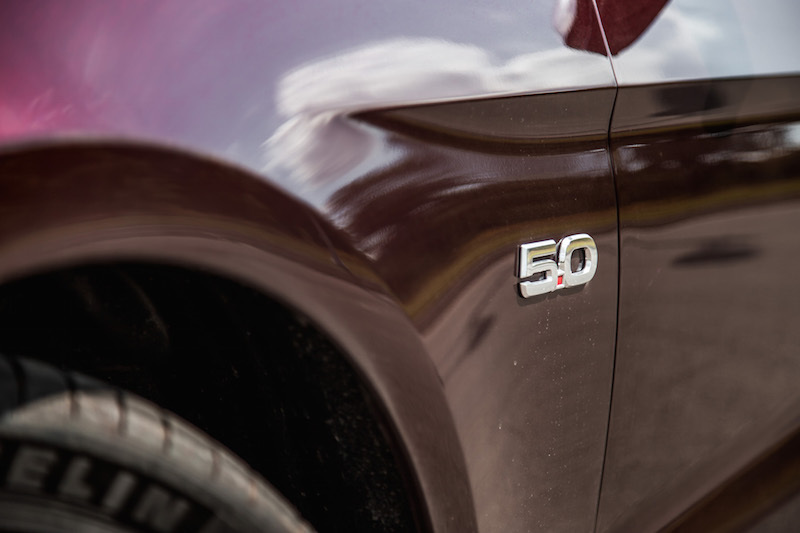 In comparison, the Camaro SS’s 6.2-litre V8 makes 5 less horsepower but 40 more lb-ft. 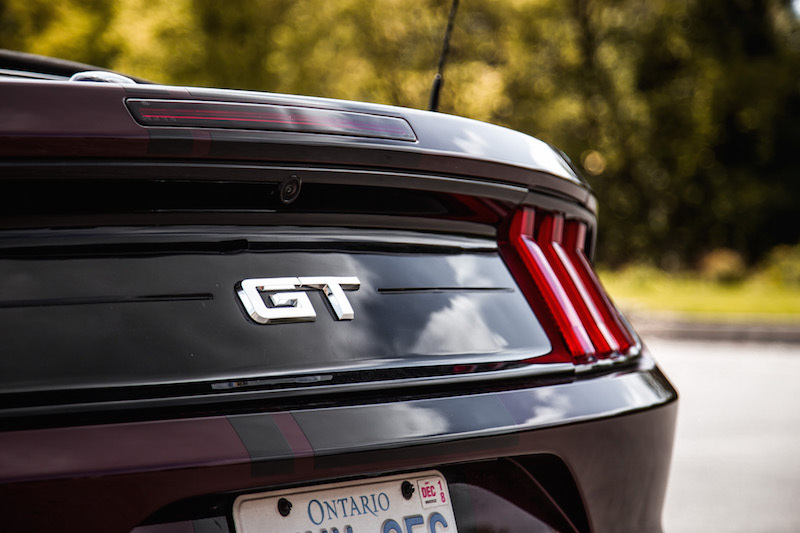 The Mustang GT punches out impressive numbers whether you care to admit it or not, and it’s a polished unit that delivers a smooth and linear build up to the red. Furthermore, this V8 offers a wall of torque even if you find yourself in the wrong gear or the wrong RPM - there’s always some juice willing to be squeezed out, and the resulting propulsive force is potent and relentless. The increase in power over previous Mustangs is noticeable, but it doesn’t vibrate with the same harshness and coarseness as before. 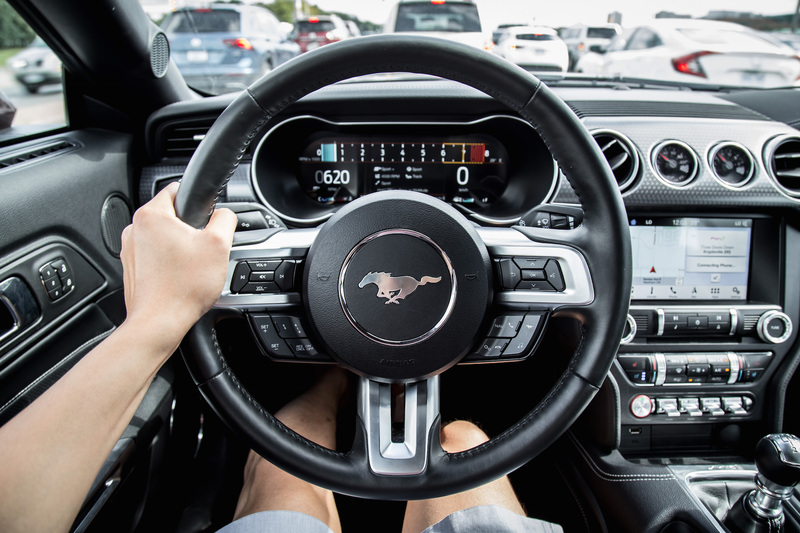 And the Mustang is still one of the only sports cars out there that still offers the classic recipe of rear-wheel drive, naturally aspirated V8, two-doors, a manual transmission, and a soft top roof. 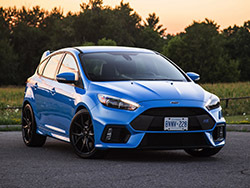 We should not take this for granted at all because if Ford ever decided to cease production, it just might break the Internet. Perhaps the biggest improvement is the exhaust noise. 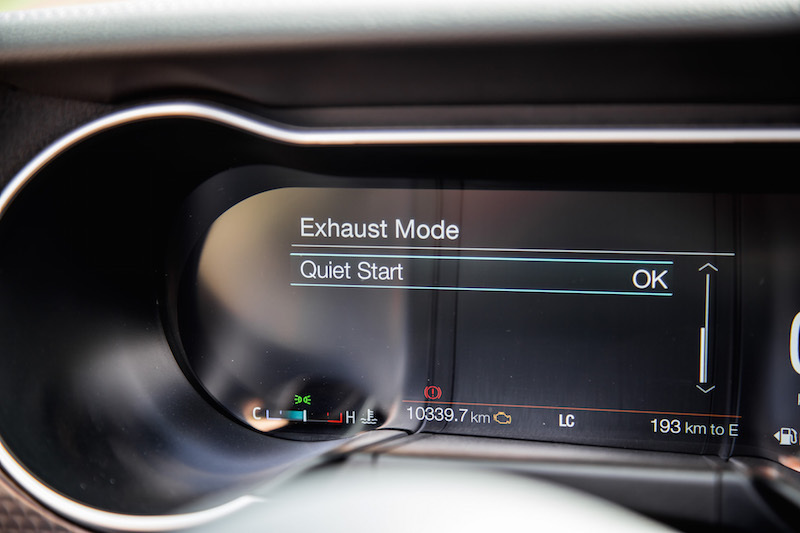 GT models come with an optional active valve exhaust ($1,000), addressing many of my previous concerns of the Mustang GT being way too quiet for a muscle car. It’s now savagely loud. The notes are deep, baritone-like, and though the octaves may be nearly as high-pitched as the Shelby’s flat-plane crank V8, it’s not nearly as exhilarating or visceral. 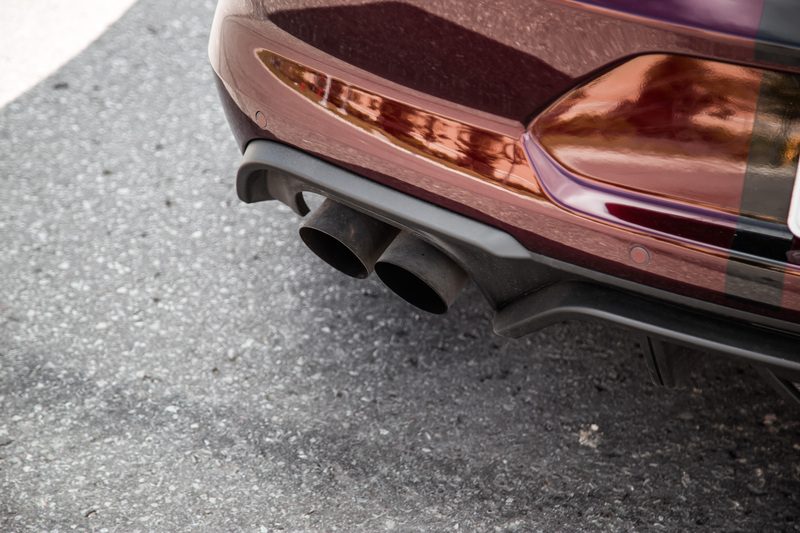 To be honest, it irks me that this exhaust isn’t standard fare. Every Mustang should sound like this. 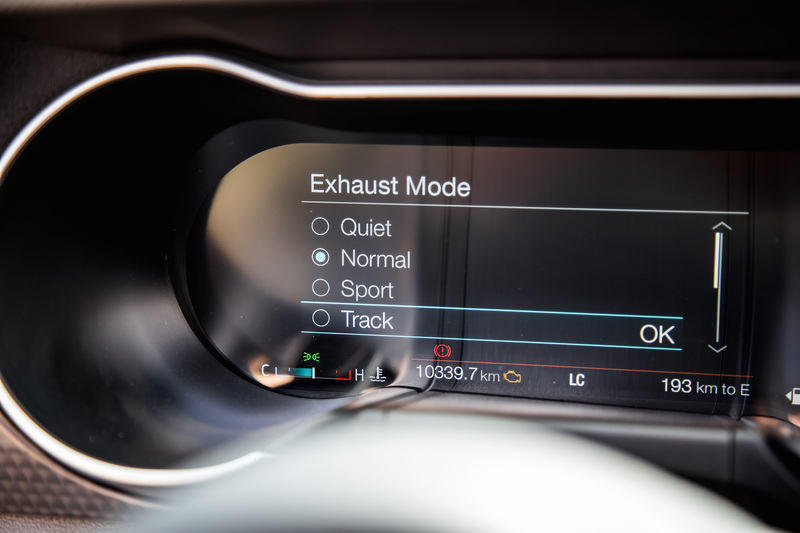 Though there is no dedicated button, you can adjust the exhaust noise manually via the driver’s gauges, going from Quiet Mode to Normal, Sport, and Track. Track is of course where you want to be all the time unless you’re creeping home late at night - Quiet Mode will hush up the exhaust quite considerably. 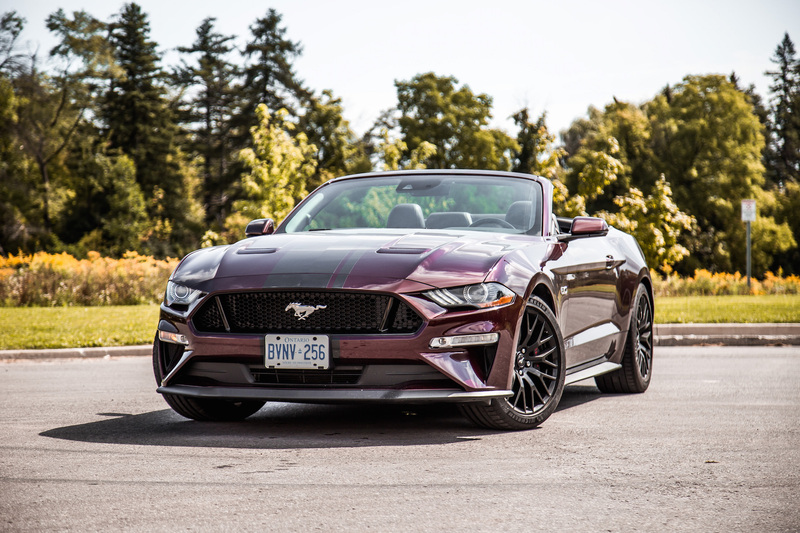 Personally I wasn’t a big fan of the redesign when it was first revealed, especially in that bright yellow goldfish paint colour, but this deep lustrous Royal Crimson colour ($450) with that black racing stripe running down the middle accentuates the Mustang’s new front hood, grill, and LED headlights without looking tacky or offensive. No longer does it look like an amphibian (as long as you stay away from that yellow). Even with the spoiler delete, which I’d rather have on, this is undoubtedly one attractive boulevard cruiser and people aren’t shy to give it compliments. 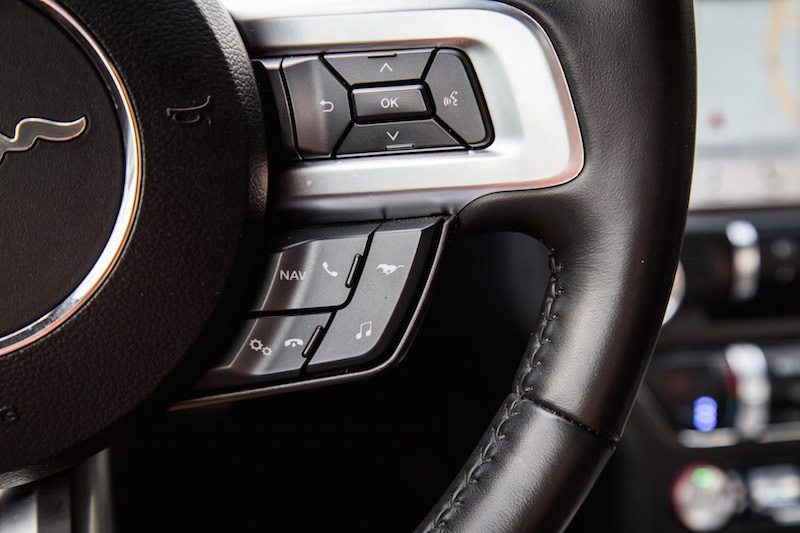 The interior gets a few notable revisions, such as the new 12-inch all-digital instrument cluster. I don’t find myself missing the analog gauges, as the instrument cluster blends modern graphics with retro fonts and styling. 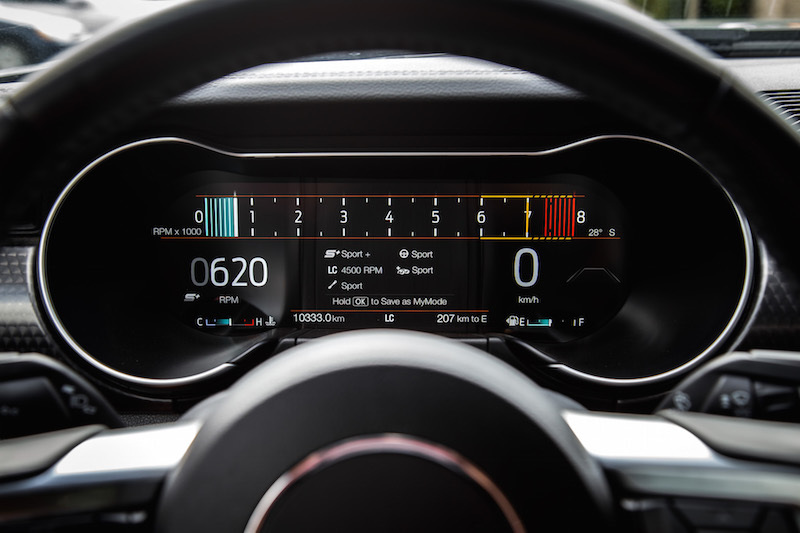 There are three unique gauge views to choose from as well, with sport, normal, and track displays, with the latter showing a digital tachometer that shows the revs going from left to the right. In my eyes, the Mustang is and never was a true sports car. It was too heavy, too cumbersome, and not as athletic as many in the segment. 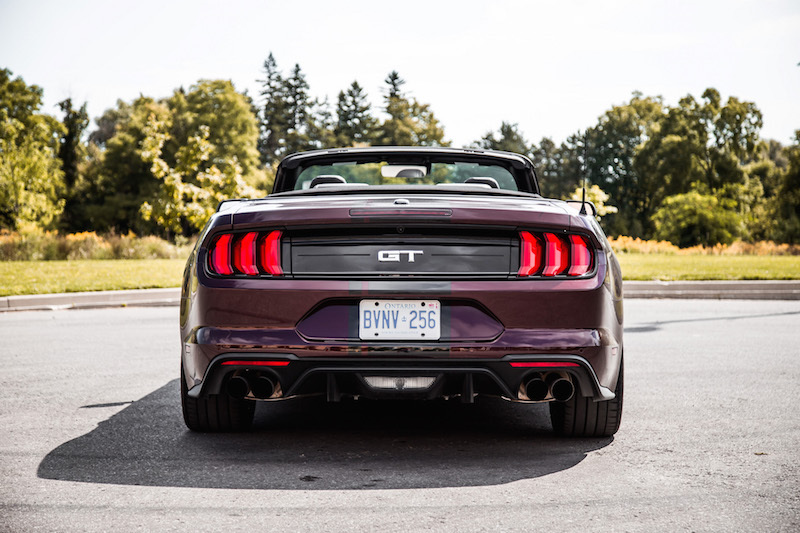 Once you get over the novelty of the bombastic exhaust, the charm of the Mustang begins to fizzle out real quick, and the same goes for the new 2018 Ford Mustang GT, revised or not. As loud as the exhaust may be, and as much power as the V8 makes, the detriments begin to become more apparent once the bubble bursts. The manual transmission isn’t bad but the clutch uptake is awkwardly high up, and the bite mark feels inconsistent. There is so much dead space in the pedal that the actual clutch bite comes around 80% up. 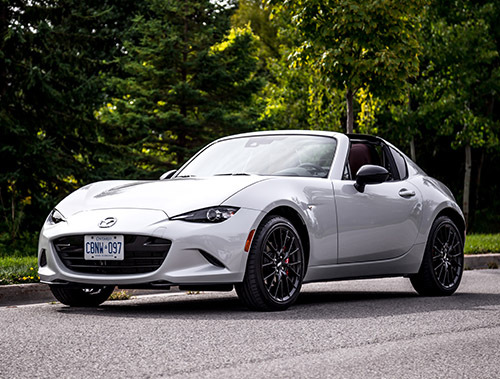 Hopping right out of a Mazda MX-5, that feels downright awful. There is an optional 10-speed automatic ($1,500) available that we did not have the chance to test. The ride quality is sublime, and errs more on the side of comfort than performance. 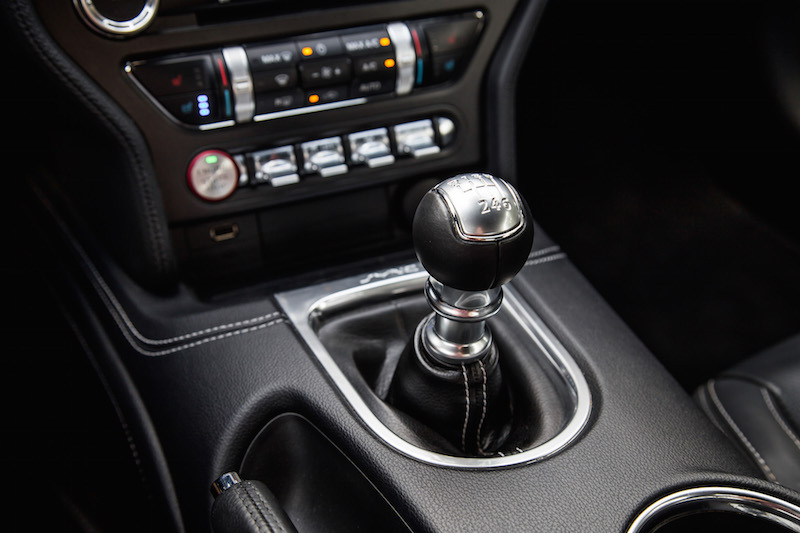 The optional MagneRide adaptive dampers ($2,000) that we had equipped is like the one used in the Shelby GT350 – it’s suspension contains metallic particles that change the viscosity of the fluid in the dampers thousands of times per second, meaning it will stiffen up or soften up depending on the terrain. You can even select five different drive modes: normal, sport, track weather, and drag (yes, the latter is for drag races). Nevertheless, I experienced way too much unwanted suspension travel to actually call it unnerving. And it wasn’t just shimmying up and down when hitting some uneven patches of pavement, but it would disappointingly shuffle from left to right as well. 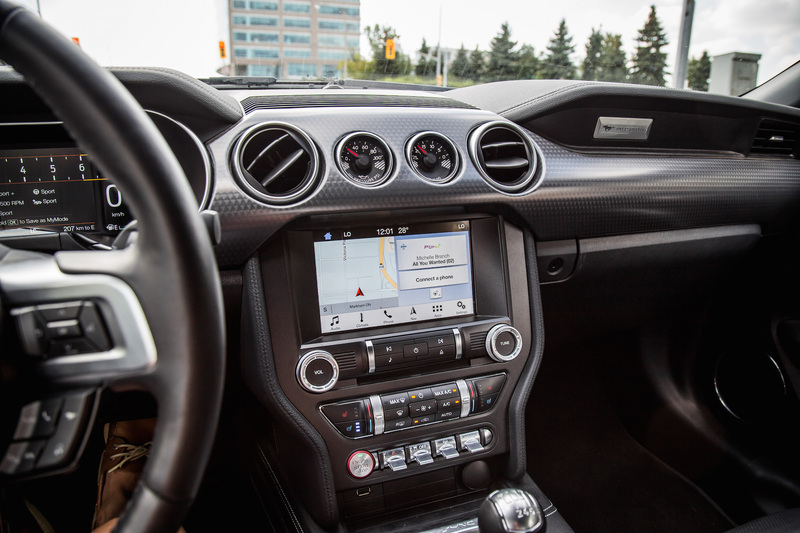 The GT Performance Package ($3,700) adds sticky Michelin PS4S tires, larger Brembo calipers, heavier duty front springs, unique chassis tuning, a strut tower brace, and a limited slip differential, and as a result our Mustang does corner particularly well and feels tight when building up considerable speeds, but it prefers running wide and you really feel that weight hindering it from being something special. The weight penalty of the convertible is undeniable and throws the balance off, with too much front-end bias without enough front-end grip. 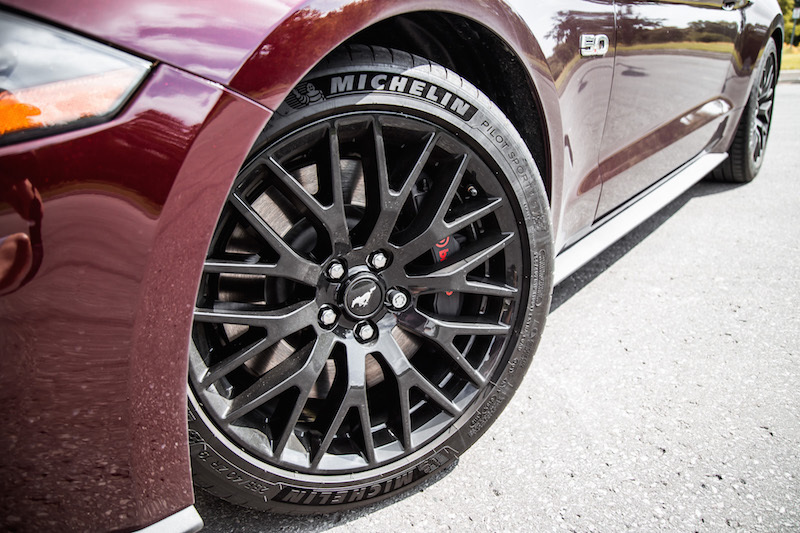 These sticky Michelin PS4S tires are a wonder, though, and do make the most out of this chassis but I feel much more confident behind the wheel of a Camaro SS Convertible, or even a Nissan 370Z Roadster. The Mustang feels like a sizable vehicle too, with a long nose and a full-sized backpack. The steering leaves something to be desired, and doesn’t mask the weight very well nor play with its stronger attributes. It feels disconnected from the front wheels and very luxury-car like, zapping out any confidence you had hopping in. On another note, the seating position is excellent and the steering wheel can be telescoped a fair amount to reach that optimal spot. The seats are exceptionally comfortable. 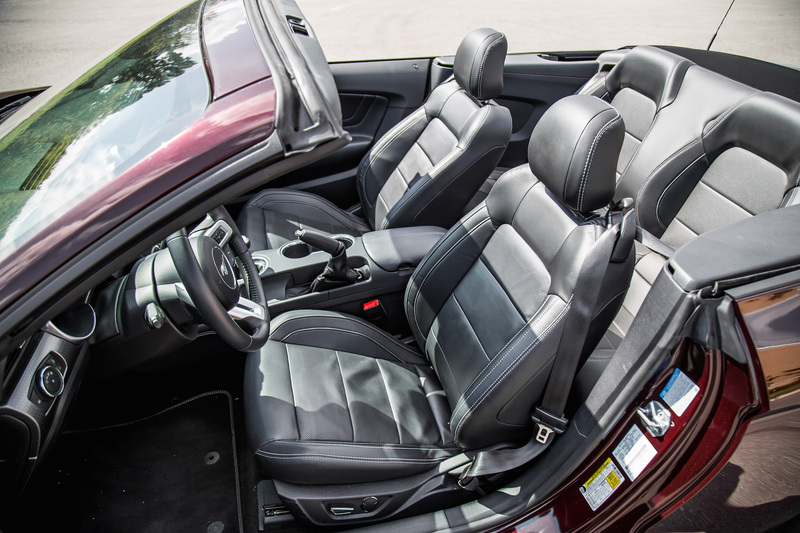 Plush, wide, and downright slippery, these leather seats are as supple as your living room couch. 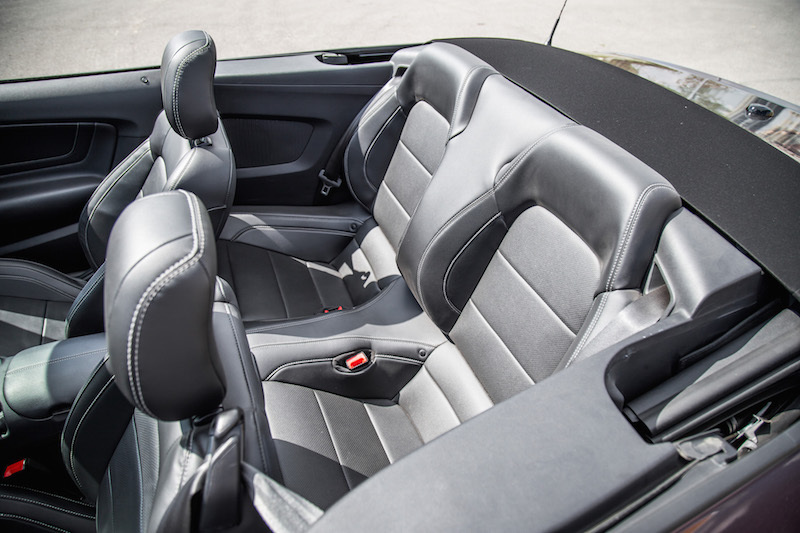 The rear seats are equally as spacious with a good amount of legroom for most adults, which is rare for a four-seat convertible. Visibility out all sides is excellent for a muscle car, and that’s a good thing as you want to take as much attention out of the chintzy and cheap feeling interior as you can. The cabin is littered with plastic panels and lacks the same fit and finish you would find in the Camaro. 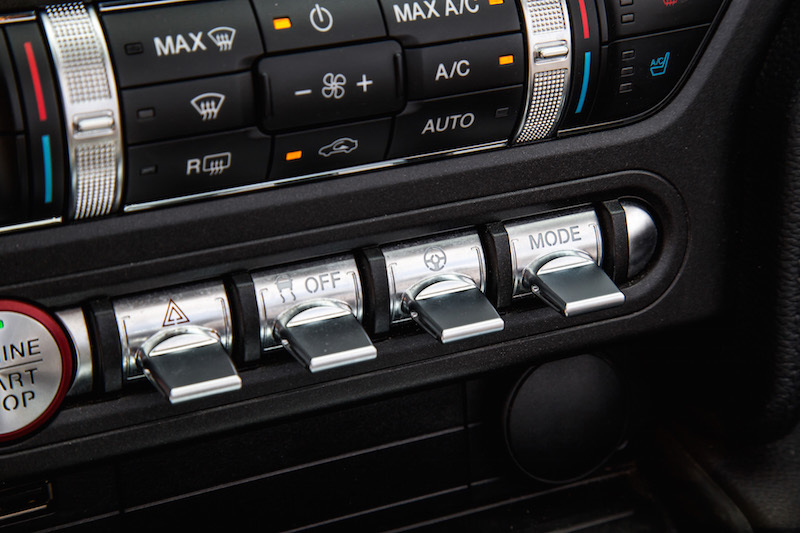 From afar, those toggle switches under the screen appear attractive and are inspired by airplanes, but get up close in person, flick them, and they feel like they’re being held on by glue and will snap if you push too hard. They don’t feel expensive at all, and I shouldn’t expect them to be at this price point but it’s a missed opportunity to shine above the competition. The Mustang gets a new keyfob, which looks like old BMW blocky design, but it’s a major improvement over the outgoing unit. You can’t operate the fabric roof at speed so if you feel the rain start trickling on your forearm, you have to make a full stop. Yes, the roof is electrically operated but you still have to manually unlatch and relatch the roof mechanism, and it takes a proper shove and pull to get it locked in place. To my annoyance, the systems won’t give a little charm or ping when the roof has finished its operation either, so you spend an extra second or two waiting for the auditory absence of whirring motors for your green light to keep driving. 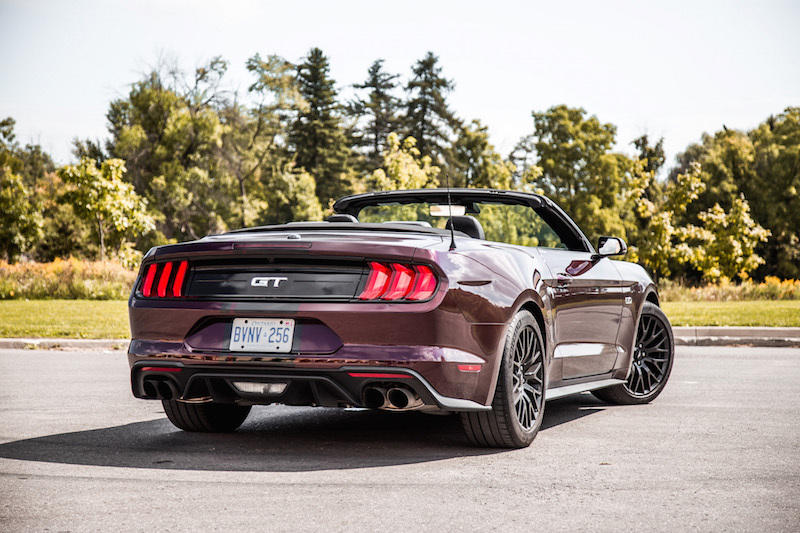 Loaded up with options, the Mustang GT is not an inexpensive convertible. Our test vehicle stickered just shy of $65,000. That’s BMW M2 kind of money. If you can’t resist the charm of a V8’s beating drums, take a look at the Chevrolet Camaro SS Convertible. The Camaro handles better, feels more athletic, has more torque, and sounds a bit better. If you’re all about brute force, check out the Challenger SRT. If you rather have some polish and shine, best to stick with the gold standard that is the Miata. That RF model with the targa top is to die for, but the interior is terribly small and cramped and I can’t see myself living with that on a daily basis. 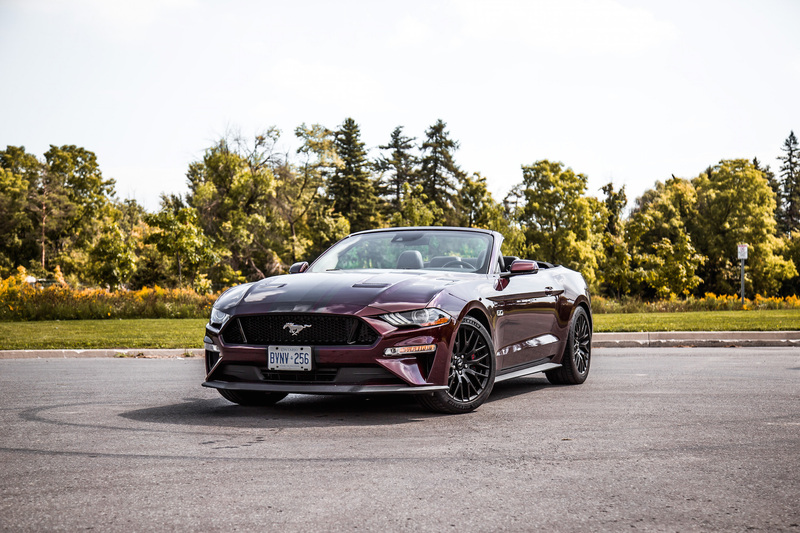 With the Mustang, you can, and it will coddle you with its supple suspension and soft leather seats, but it won’t wow you with anything but its menacing exhaust, and that’s what makes it hard to recommend. 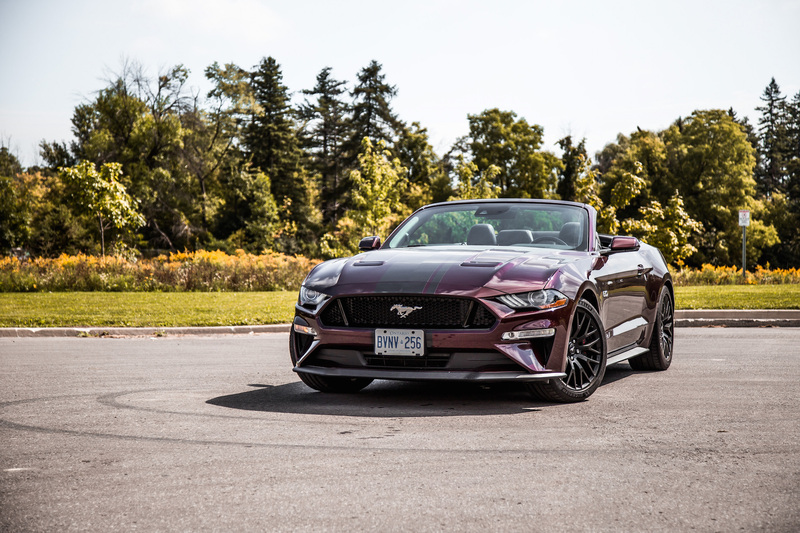 The charm is there but despite minor revisions to keep it relevant and afloat, the Mustang is fading quicker than expected.